So, I definitely wanted to share the recipe with all of you, as it is prime soup tasting weather. And like any other soup, it just tastes better the longer it sits! In a large pan saute the above ingredients on a low simmer until tender. In a small bowl combine 4 T. flour with 1/2 c. water. Wisk into the soup and bring to a boil. Add in 1 pound of diced/shredded chicken and simmer another 5 minutes. The best way to eat this soup in my opinion? 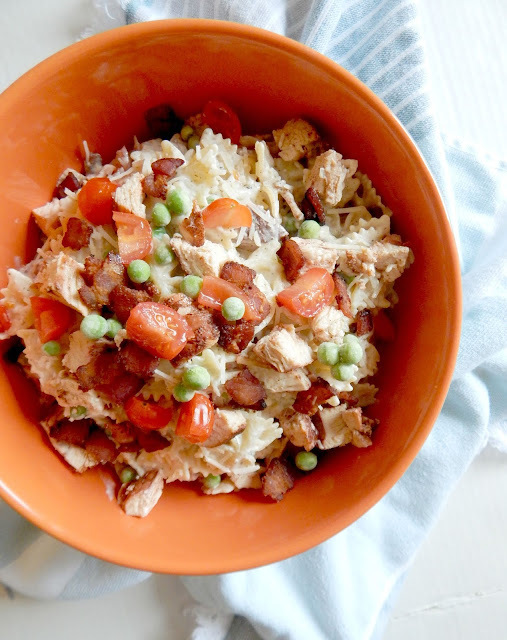 Add a doll up of sour cream to your bowl and a handful of crushed tortilla chips...genius. If you want to go the healthy route, skip the sour cream and you still have a great bowl of goodness for very little calories. Try this, you'll love it! Looks delicious...especially with the sliced avocado on top! My favorite soup? Hmm thats a hard one but I am always a fan of broccoli cheddar or french onion! Looks so good-Love tortilla soups! Yummy! I have never had this type of soup before! Something I will have to try! 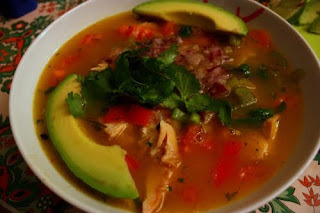 I absolutely LOVE tortilla soup - yours looks delicious! Hey Ally - I think you forgot the chicken! I saw the chicken in the picture, but am sure that it would taste good without it!